Is open data the death of FOI? The simple answer is yes, but, we know it is not as simple as that. There is growing evidence emerging of the inefficiencies of a closed data culture in central and local government. With this blog post we are making the case for how open data can answer some of the challenges caused by FOI (Freedom of Information Act 2000 and Freedom of Information Act (Scotland) 2002) in central and local government bodies, and how potentially going above and beyond publishing statutory information about their activities can result in short, medium and long-term benefits. Open data means the proactive publication of whole classes of information, released into the wild for use and reuse under various licenses. The Open Government Partnership Declaration calls for governments to commit to “pro-actively provide high-value information, including raw data, in a timely manner, in formats that the public can easily locate, understand and use, and in formats that facilitate reuse.”. While the International Open Data Charter, adopted by 41 governments, 16 national and 25 local/subnational governments, urges governments to open their data in digital formats by default and invest in the creation and foster a culture of openness. In the UK over 100,000 organisations are subject to the Freedom of Information Act 2000 or the Freedom of Information Act (Scotland) 2002, including all central government bodies, local authorities and schools. The Cabinet Office publishes a quarterly statistics bulletin on FOI. This bulletin reports statistics on a total of 41 central government bodies. The statistics cover only non-routine written requests for information. Information given out on request as a part of routine business, including information released in the form of leaflets, correspondence exchanges, reports and other published material, and through websites and departmental FOI Publication Schemes are not counted. In 2005 according to an independent report published by Frontier Economics, the total cost of dealing with FOI requests across central government was £24.4 million per year. The report estimated that the wider public sector received at least 87,000 FOI requests annually. This was more than twice the number handled by central government in 2005. Frontier Economics estimated the cost of handling these requests to be £11.1 million per year. Local authorities are estimated to have the highest volume of FOI requests outside central government, receiving around 60,000 per year at a cost of £8 million. It should be noted that the cost estimates above represent the full costs of dealing with requests for information - they do not reflect the additional costs of implementing the FOI legislation. The average (hourly) cost of officials’ time in responding to FOI requests within central government was £34 in 2005. It took on average 7.5 hrs to deal with a request which means that the average cost of officials’ time for an initial FOI request was approximately £254 in central government. An FOI costing exercise carried out by the Scottish Government in 2009-2010 collected information on the amount of staff time taken responding to requests for 186 out of the 253 cases registered during the nine-week survey period by the core Scottish Government and those agencies with access to the Scottish Government’s Information Request Tracker. 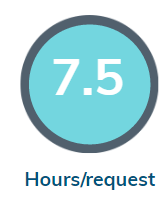 On average it took a little over 7 hours to respond to a request with a £189 average cost. These numbers are excluding FOI Unit staff time and costs. The information that can be released under the FOI Acts is public knowledge, so why not publish it pro-actively online, accessible to all? Very often a lot of organisations we talk to don’t realise that they are already publishing data - they already have certain open datasets on their website, so why not do more? Who is interested in your data? However when it comes to open data, especially the raw format of data, the group of data consumers encompass businesses (19 innovative UK business working with open data), app developers (see for example the Transport for London open data success story) and also journalists are increasingly learning data scientist and data mining skills. Open data also helps engage with these wider audiences, while at the same time addresses the pain of FOI, enables colleagues to access and reuse the data internally, resulting in more transparency and operational efficiency among others. Opening up data, in smart ways through online data portals does ease the pain of FOI, enables collaboration across the organisation and the wider community and has the potential to save your organisation 10’s and 100’s of thousands of £ annually. Is open data the death of FOI? In the short term probably not, however in the long term it has the potential to free up resources currently tied into responding to FOI requests and contribute to local, central and wider public sector organisational and business process transformation. Unsure on how to get started on your open data journey? Get in touch with us for a free one-to-one session on open data or sign up for a free USMART open data platform trial by filling out the form below. Sign up with your email address to start the ball rolling on your free USMART trial.